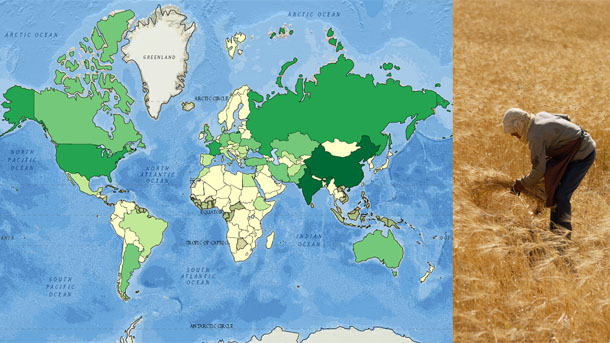 Take a look through our new map layers on the world’s leading food crops. Cereals, such as wheat, are the world’s leading food crops. Sophisticated and often expensive equipment (such as combines) account for most of the 2.3 billion tons of cereals produced every year. Hand-harvesting wheat, as this man is doing in Lebanon, is largely done by subsistence farmers. Crops fall into six categories: food crops, feed crops, fiber crops, oil crops, ornamental crops, and industrial crops. Saffron, vanilla, and chocolate are all food crops. 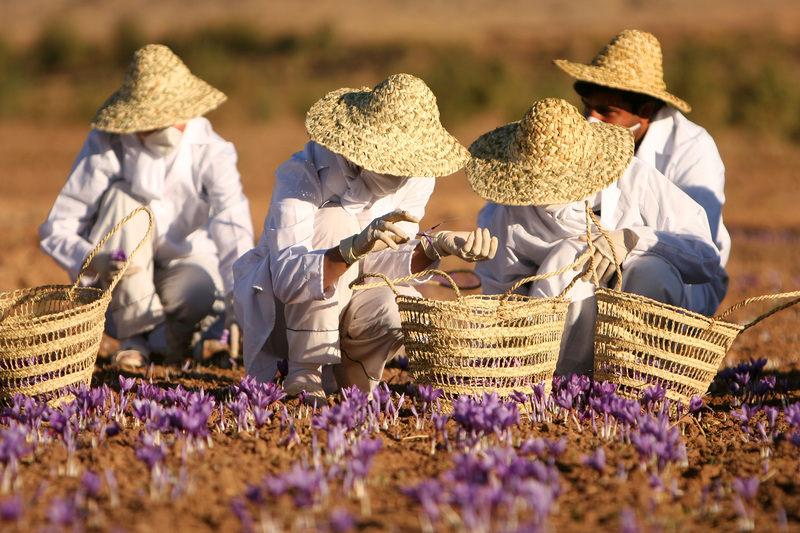 This spectacular image captures workers harvesting saffron in Torbat-e Heydarieh, Razavi Khorasan Province, Iran. Iran is one of the leading producers of saffron, a spice that must be extracted from the pistils of crocus flowers. Photograph by Safa Daneshvar, courtesy Wikimedia. This file is licensed under the Creative Commons Attribution-Share Alike 3.0 Unported license. Palm oil and cottonseed oil are oil crops. 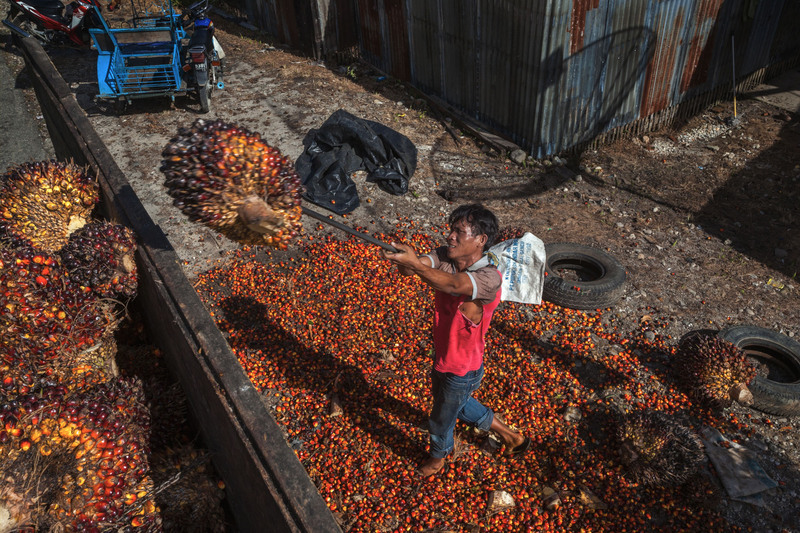 Palm oil is extracted from the fruit of palm fruits like these, harvested in Sumatra, Indonesia. Cotton is a fiber crop. 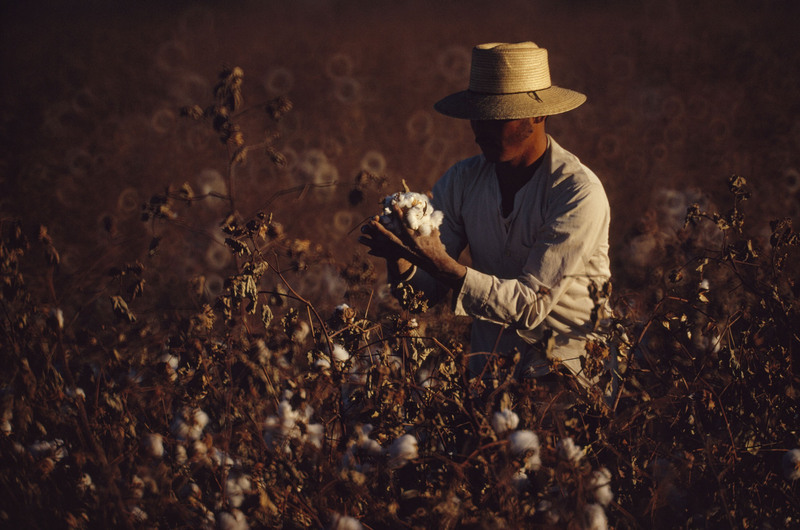 A harvester examines a boll of cotton, harvested for fiber as well as oil, in Mexicali, Baja California, Mexico. Are any of the hand-harvested crops described in the NPR article staple foods? Nope. According to our encyclopedic entry, “A food staple is a food that makes up the dominant part of a population’s diet. Food staples are eaten regularly—even daily—and supply a major proportion of a person’s energy and nutritional needs.” The three food crops described in the NPR article—saffron, vanilla, and chocolate—do not fit this description. Our media spotlight reminds readers that “crops don’t always serve people near where they are grown. Crops grown in one place might be exported to another.” Do you think any of the hand-harvested crops described in the NPR article are consumed where they are produced? Palm oil is both heavily produced and consumed in West Africa. On the other hand, many cocoa farmers in West Africa have never even tasted the chocolate they harvest. Fast-forward to about 0:56 in this video to see an Ivory Coast cocoa farmer taste processed chocolate for the first time. Browse through our maps of the world leading food crops. What leading food crops are harvested in areas where hand-harvesting is done for the specialized crops described in the NPR article? Italy (which hand-harvests saffron) also produces rice, maize, soy, potatoes, and wheat. Madagascar (which hand-harvests vanilla) also produces sweet potatoes, rice, and cassava. Ivory Coast (which hand-harvests chocolate) also produces cassava, yams, plantains, and wheat. Philippines (which hand-harvests palm nuts for palm oil) also produces wheat, yams, sweet potatoes, and rice. India (which hand harvests cotton) produces all major staple food crops except yams and plantains. Grow Agriculture (Plants & Trees). Lets change the world into Green environment.